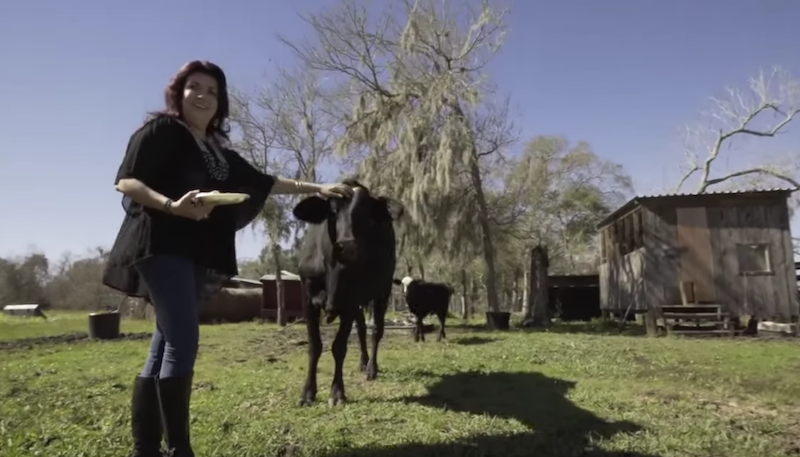 What Happens When a Cattle Rancher Turns Vegan? Why, the ranch becomes the first ever cattle ranch, turned animal sanctuary, of course. This is an epic love story. Renee King-Sonnen married cattle rancher Tommy Sonnen almost six years ago. Before they married she was a meat eating Texan like her husband. Moving from suburbia to live with her multi-generational cattle ranching husband in Angleton, Texas, didn’t seem like that big of a deal at first. After all, she was in love. But she also fell in love with the animals on the farm. She named the cows, hung out with the cows, and sang to the cows. After a few years, she couldn’t stand it when the red trailer took the calves away from their mothers, to be sold, and most certainly slaughtered. Watching the mama cows run after the trailers, cry for their lost children and then be depressed for a week, according to Renee, was just more than she could take. For several years this scenario played itself out. Finally Renee gave her husband an ultimatum. If the red trailer left with calves again, she would be leaving right behind it. Whoa! Now what is a red-blooded, Texas rancher, and man’s man supposed to do with that? Divorce seemed imminent. To his immense credit (and this is why I call it an epic love story), Tommy, who had been trying for years to arrange the departure of the red trailer so that his wife wouldn’t see, acquiesced, and decided he would sell the entire herd and get out of the business. Even before her husband made the decision to get out of the cattle ranching business, Renee had had enough of eating meat. On October 31, 2014, Renee became a vegan. She had been reading up on veganism and watching videos about farm animal cruelty. And she was on a mission. She had also started a blog and Facebook page called Vegan Journal of a Rancher’s Wife. When Tommy decided to sell the herd, Renee asked if he would sell the cattle to her. When he agreed, Renee started an Indigogo fundraising campaign and raised more than $30,000 to buy the cattle from her husband. And the journey toward The Rowdy Girl Sanctuary had begun. When I first saw the story of the Rowdy Girl Sanctuary on Steve Hartman’s On the Road I was fascinated. I went to the sanctuary website and read everything I could about the sanctuary and Renee King-Sonnen. But I felt in my gut that something was missing from the accounts I was reading. So I decided to phone Renee and talk to her myself. She picked up the phone on the first ring, but explained that she and her husband were buying feed for the animals, but that she would call me back. And she did! I was right. There was definitely more to the story—more than the mainstream media reports were willing to write about or more than she had been willing to share with them. We spoke for half an hour. Renee is 58 years old and has been practicing yoga for half of her life. She’s an advanced yoga teacher and an ayurvedic practitioner. Renee has meditated for many years. She told me that she believed becoming a vegan and starting the sanctuary had been “divinely orchestrated” and that “my destiny had caught up with me.” She said the teaching of ahimsa from Patanjali’s Yoga Sutras had always been with her but that she had not connected it to the animals she ate. After becoming a vegan, she feels she received “a spiritual download” of information that guided her toward turning the ranch into an animal sanctuary. Renee also passionately believes that human beings will never stop fighting wars and will never end hatred and the exploitation of others, until we stop exploiting and killing animals for food. Tommy agreed to sell his wife the cattle and lease the ranch to the sanctuary for $1 a year until the sanctuary was self-sustaining. And then he went to work for his wife. He watched “every single vegan documentary” his wife “put in front of him” and is now completely vegan. 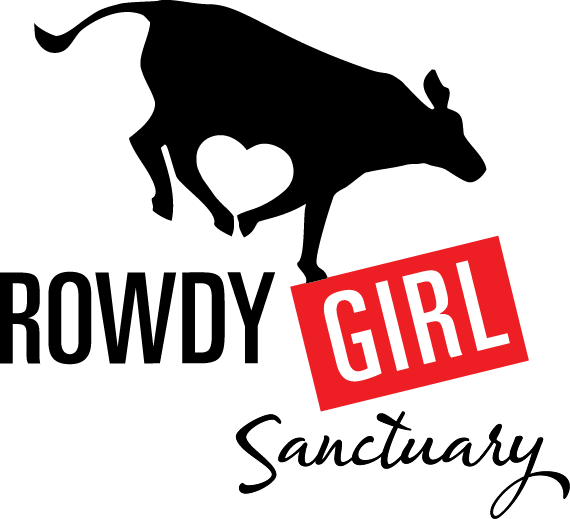 Rowdy Girl Sanctuary is only a year old, having become a 501c3 non-profit in February, 2015. The sanctuary needs to do a lot of fundraising and is hosting some fantastic vegan events. If you live any where near Houston, check out the website for events like the Second Annual Vegan Awareness Festival on May 21, 2016. I’m tempted to fly to Texas for this one—The Rowdy Girls Vegan Cowgirl Campout. But if you’re not in Texas you can still help this very special sanctuary by donating. It takes a lot of money to care for the animals, and Renee and Tommy want to be able to add even more rescued animals.